Tel Aviv and Jerusalem may be worlds apart in character, but it’s really simple and quick to travel from Tel Aviv to Jerusalem and back again. If you’re looking for more information on Tel Aviv, check out iTravelTelAviv.com or our favorite independent Tel Aviv city guide! The morning and late afternoon are notorious for slow and heavy traffic as you enter and leave both Tel Aviv and Jerusalem. Peak hour traffic extends journey time from 50 minutes to up to two hours. If you’re traveling between cities in the afternoon, aim to depart by 3:30 pm latest or wait till 6:30 pm to avoid traffic. Read more about driving in Israel. Israel’s public bus company, Egged, offers comfortable, air-conditioned buses between Jerusalem and other cities in Israel, including Tel Aviv. The bus leaves from the Jerusalem central bus station, and tickets can either be purchased at a ticket booth with cash or credit card, or on the bus with cash. Students are entitled to a discount upon presentation of a valid international student card, and soldiers and the elderly also receive discounts. Children under the age of 5 are free if accompanied by a paying adult. There are two buses to Tel Aviv from Jerusalem: The 480 heads to Arlozorov Train Station (approximately every 10 minutes) in upmarket North Tel Aviv and the 405 heads to the Tel Aviv Central Bus Station (approximately every 20 minutes) in south Tel Aviv. Both buses are about 50 minutes in duration. A one-way ticket will cost 18 ILS and there is usually a discounted rate for roundtrip fares. Bear in mind that buses don’t run on Shabbat (Sabbath) between Friday afternoon and Saturday evening. The new Tel Aviv – Jerusalem railway line was officially launched on the 25th of September 2018. The line departs from the new Yitzhak Navon Station on Shazar Street in Jerusalem and is planned to end at Tel Aviv-Savidor Center Station, and at Herzelia Station in the future. During its initial period of running, the line operates between Yitzhak Navon Station, located in the center of Jerusalem, and Ben-Gurion Airport Station, where passengers can transfer to additional lines. Travelling from Jerusalem to Ben-Gurion Airport takes about 25 minutes and travelling from Jerusalem to Tel Aviv (HaHagana Station) takes about 45 minutes. Starting from December 25th, 2018 and until August 24th, 2019, passengers who will purchase tickets for the high-speed line at Ben-Gurion Airport Station will enjoy a discount of 50% off their train tickets. There is no passenger parking at Yizhak Navon Train Station. However, there are several available parking lots around the station within 50-900 meters from the railway station. The station is located within walking distance from Binyenei HaUma – International Convention Center (150 meters) and from Jerusalem Central Bus Station, and it is a kilometer away from Machane Yehuda Market. The centrally located terminus is spread over 5 accessible floors. Passengers who need a wheelchair lift to get on and off the train are highly encouraged to coordinate their travel in advance so that the presence of an operating staff member is granted. Visit Israel Railways website or contact customer service for booking and coordination. Train Station Hours: Yitzhak Navon Station is open Sunday-Thursday, 6:00 AM – 8:00 PM; Rav-Kav Ticket Office is open 7:00 AM – 6:30 PM. Yitzhak Navon Station is closed Fridays and Saturdays. Private taxi cabs can be arranged for any destination in Israel, including Tel Aviv, with the cost to or from Jerusalem around 250 ILS to your destination (300-350 ILS after 9:00 pm). Israel’s main international airport is situated around 15-20 minutes from Tel Aviv and approximately 45 minutes from Jerusalem. Read about getting from Ben Gurion Airport to Jerusalem. During your time in Jerusalem, we recommend you take advantage of the rich variety of day tours at your fingertips. For example, join a bike tour of Jerusalem that takes you further distances than on walking tours and into small corners unreachable by car. Take a Segway tour for the fun experience of riding a hi tech piece of machinery while zipping by Jerusalem’s most wonderful historical and religious sites. 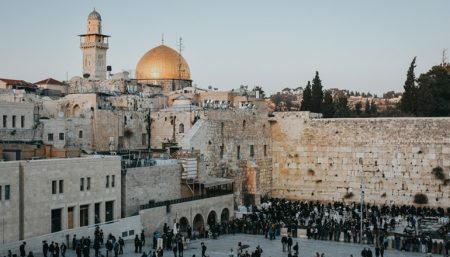 Or join a meaningful, fun day touring both Jerusalem and nearby areas such as the relaxing Dead Sea or the holy city of Bethlehem. Either way, be sure to join a tour of the Old City of Jerusalem.